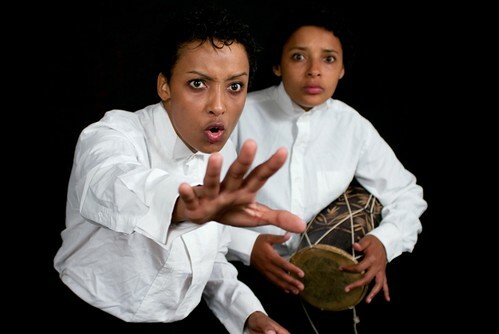 Toto Tales Productions’ I Knew A Man Called Livingstone is designed to fit in with the bicentenary of the birth of Scottish doctor, missionary and explorer David Livingstone. Running alongside the exhibition devoted to Blantyre’s most famous son, the play deals with the doctor from an African perspective. Writer Mara Menzies and her sister Isla Menzies are the two performers in this engaging and stimulating piece. Although they play a variety of characters, the two central figures are James Chuma and Abdullah Susi, faithful companions of Livingstone who were responsible for returning his body to Britain. The two sisters display a pleasing rapport with each other and the audience. A substantial Fringe run seems to have honed their performances, which have an easy fluency and a perfect rhythm. At first the occasional, low-key interaction with the audience seems to come as a shock to some, but is expertly handled and creates a feeling of real warmth. The play is obviously designed so that it can be presented to younger audiences than the one present here – it is advertised as being suitable for aged 8 upwards, but would probably work best around Primary 7 level. That is not to say that it is not effective for adult audiences; indeed, it is carefully crafted to have the widest possible appeal. Informative and entertaining without ever apparently straining for effect, this is the work of two highly accomplished tellers of tales. Drumming, dancing, comedy and recorded sound are subtly used, while the various different characters are subtly introduced and elegantly differentiated. There seems a slight danger that the accents might approach parody – the exaggerated Scottish accent used for Livingstone, for example, might undermine his character – but this never quite happens. Indeed, giving the doctor an overstated accent makes a valuable point – it is, after all, the European who is the outsider here, the one with the comedy voice. Overall, the comedy is infectiously effective, while the dramatic moments are presented with sincerity and effortless skill. The standout character is probably the haughty Princess Manenko, whose spirited chiding of the audience produces the greatest reaction. However, it is another character, the Arab slave trader who points out the contradictions in Livingstone’s abolitionist viewpoint, which crystallises why this production is so interesting. Everything here is light and shade; it shows a Livingstone who was a poor missionary and a less-than-keen family man. He apparently only had one convert, with those he encountered far more likely to embrace Islam; he also seemed to neglect his children. However, he also seemed to inspire genuine affection in those he encountered and this play goes a long way to showing why. The staging is simple and effective, with Annie George’s direction adding just the right amount of variety. There is a real energy to the whole piece which, backed up by some subtle, nuanced content working on more than one level, makes for excellent, thoughtful entertainment.